There is a time of year that is so sweet and so satisfying that a most appropriate way to describe it is with one word: delicious. 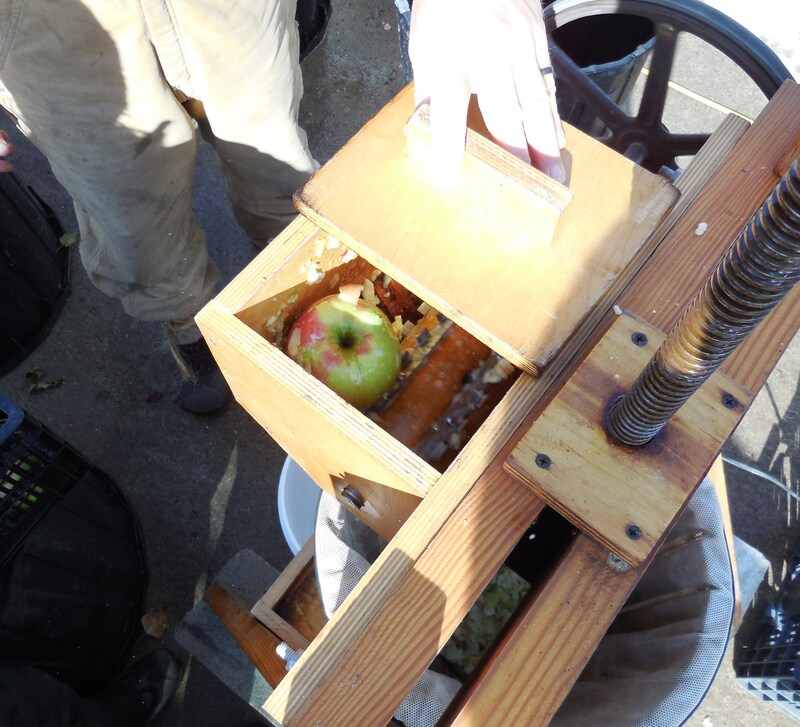 It is apple pressing time. It’s also a time of winter preparation. A time of sustenance. This is a notion that was forgotten by many and is only recently coming alive again: a rebirth. For many decades we have gradually forgotten about food storage and preparation. Cooking in the kitchen, sustaining a family with homemade foods, preparing for winter, storing food, were not part of the average family’s routine for the past 40 years. Our industrialized food system changed that. Now, there is a revival. A movement to reclaim those important food cultures that we lost not so long ago. I am happy to be a part of that rebirth with my family. Our awareness began over 15 years ago with the birth of our first child. It was then that I first knew something in our food system and consumer society wasn’t healthy and I wanted to change it. Change started small for us, a single strand, but has rapidly grown into a huge organic web during the last decade and a half. Slow food is just one strand in our organic web. Pressing Apples is an even smaller strand. Though no matter how small, none are insignificant. Pressing begins with picking. Throughout apple picking season we take the opportunity to harvest as many apples as we have time to pick. We don’t limit our picking to our trees, but also visit local orchards including our neighbor’s and our parents’ backyard orchards. Sometimes we get lucky and arrive to find a few 5 gallon buckets already picked for us (by our parents, of course.) Otherwise, we pick and pick and pick, until one of the crew starts eating more apples than he or she is picking. 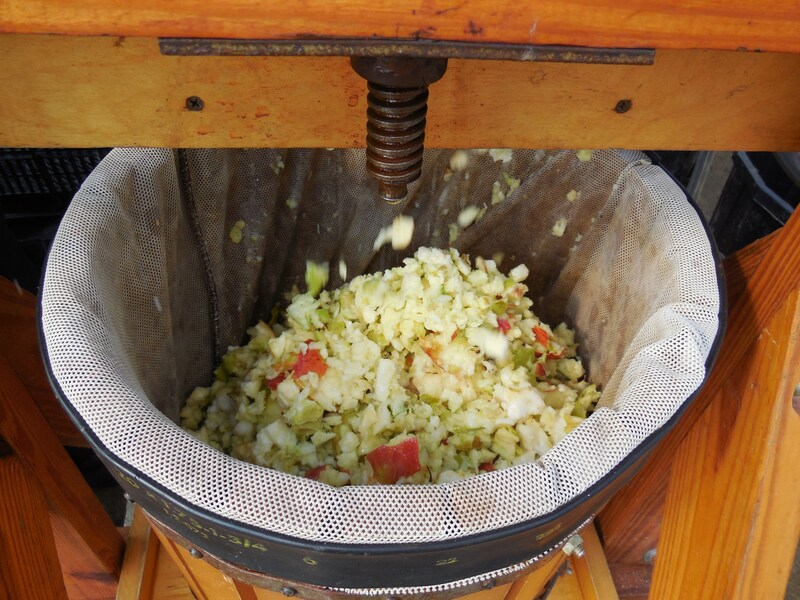 We store the apples for a short time until we have enough for pressing. 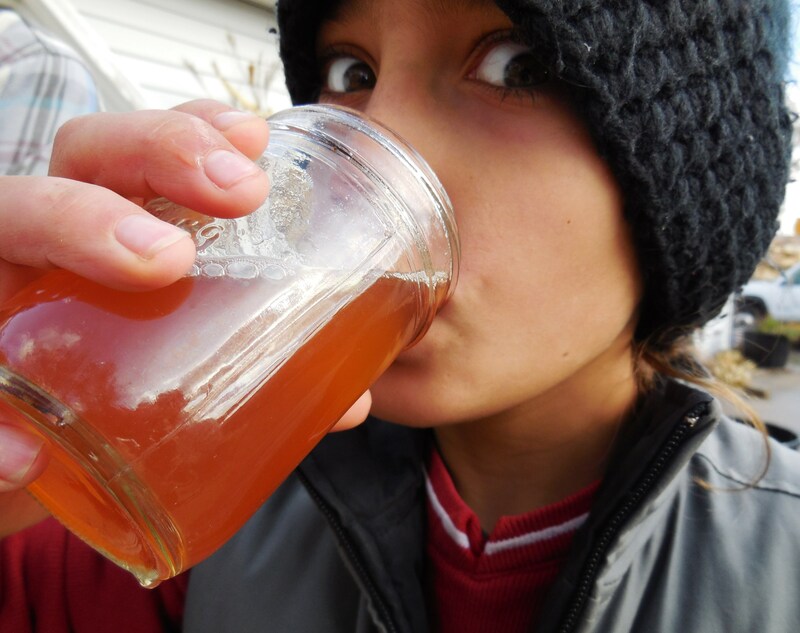 On average we get 3 gallons of cider per bushel of apples. A bushel of apples weighs about 45 pounds. First, we’ll set aside those that have great storage abilities, which include certain varieties and those with little or no blemishes. These we keep for winter eating. We’ll store them in our root cellar and eat them until they begin to soften and shrivel, usually into March or April. 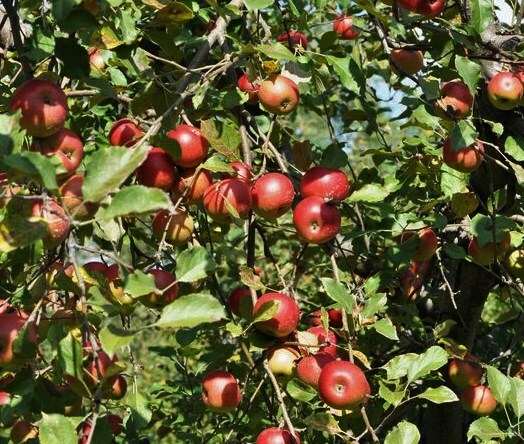 What apples that aren’t set aside for storage will be made into cider. 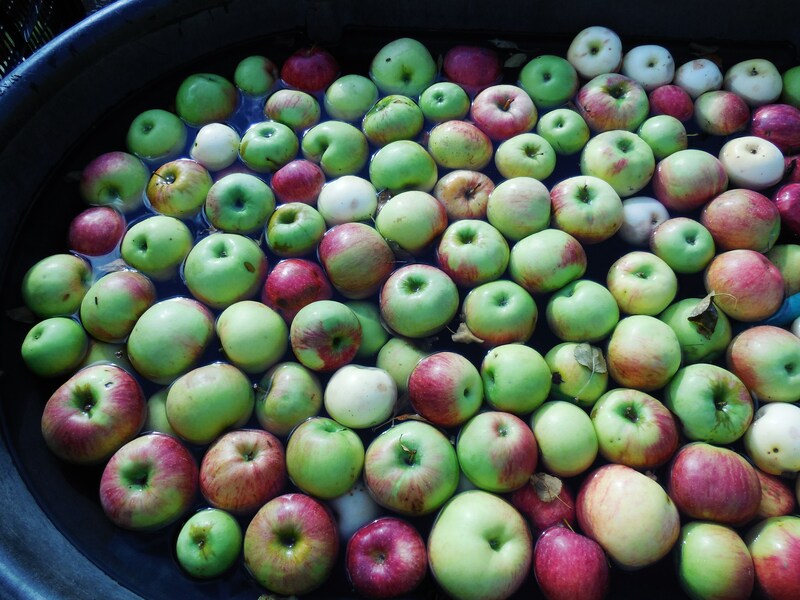 We sort and wash the apples before pressing. 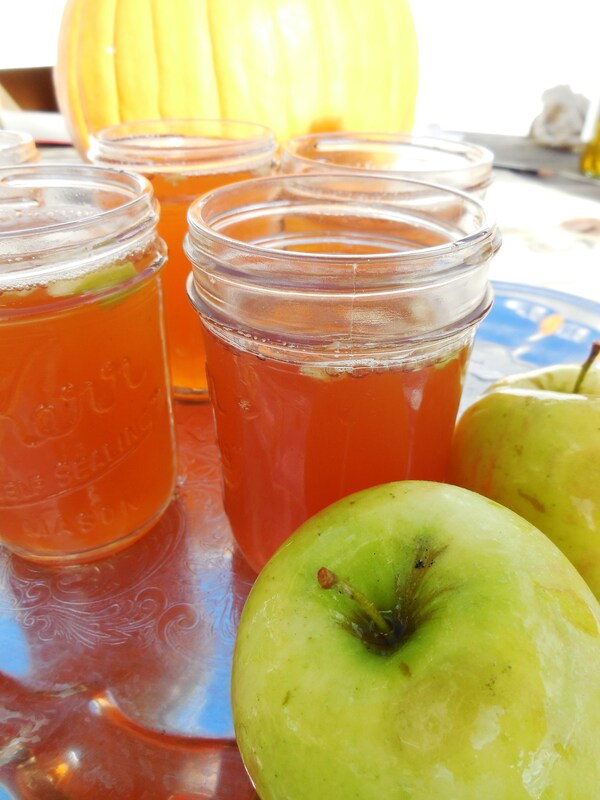 Blemishes, bruises, and a few worm holes are non-issues, and apples with those problems make fine cider. A mixture of apple varieties results in the best tasting cider. 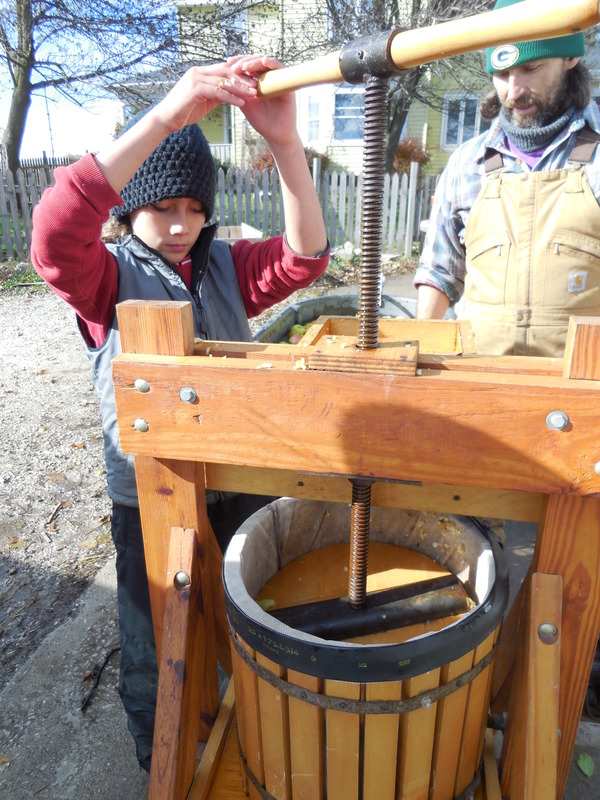 The cider press is borrowed from our neighbors. They used it for years before retiring it to the barn. They offered it to us for use. This type of community sharing and giving is integral in repairing our broken food system. We appreciate their offering more that we can express. We return the press with a few gallons of cider and the intention of returning a few weeks later with a big chunk of smoked turkey in hand (the result of raising 5 free-range happy turkeys). The pressing process is simple. 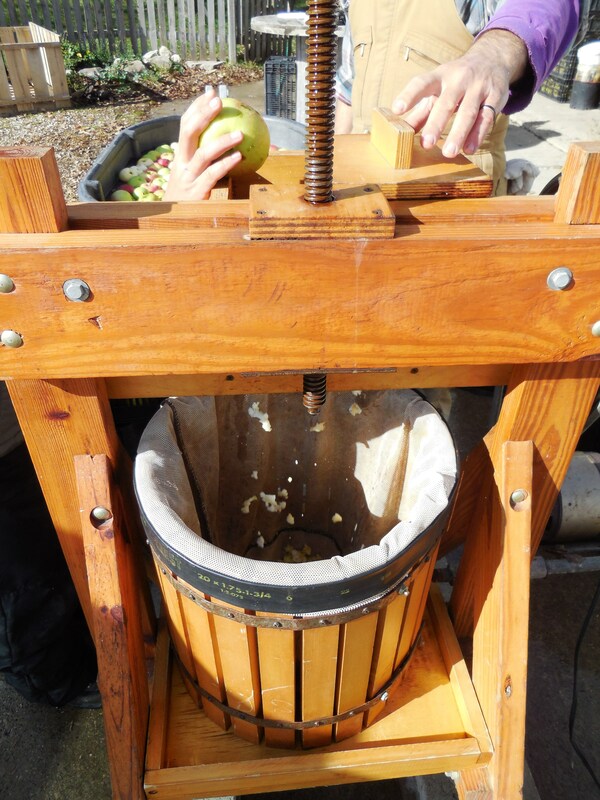 After washing the apples, a few handfuls are placed into the grinder box. This is where they are chopped into bits. The bits fall into the round mesh-lined slatted bin below. Once the bin is full, we cover it with a wooden piece a little smaller than the inside of the bin. The cover is then pressed down by hand cranking onto the apple bits. 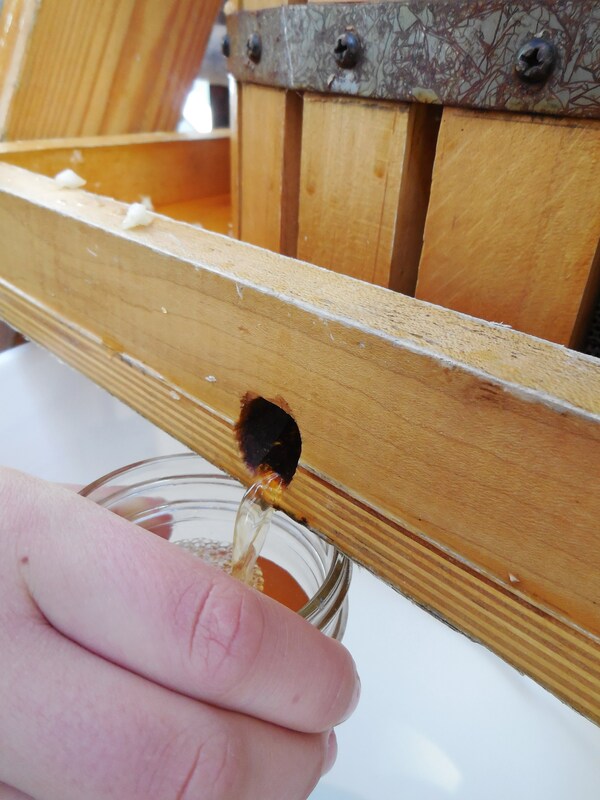 The apple juice is pressed out of the bits and flows through the mesh bag, past the wooden slats, into a rimmed base, out a hole and into a bucket. 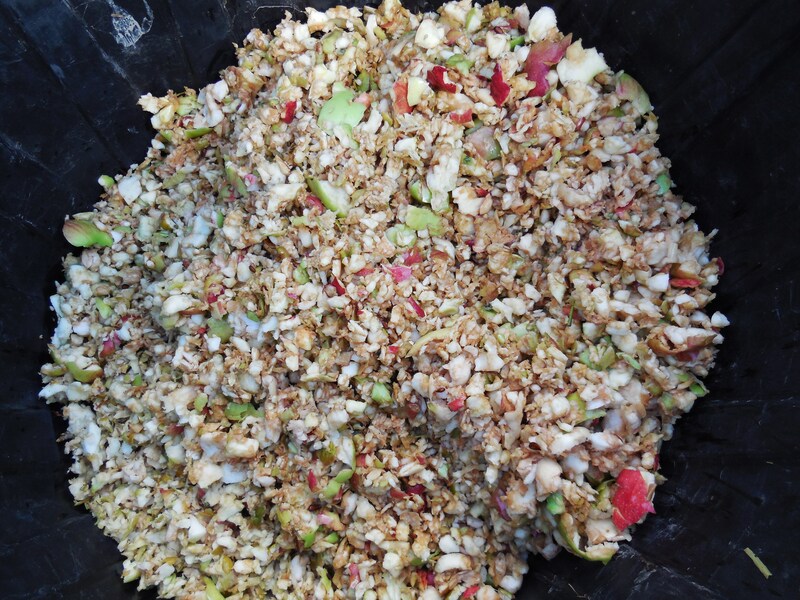 After all of the juice is pressed out of the bits, the remaining pulp is given to the chickens to pick at and added to our fields to increase organic matter. Instead of purchasing more items, we use what we have. 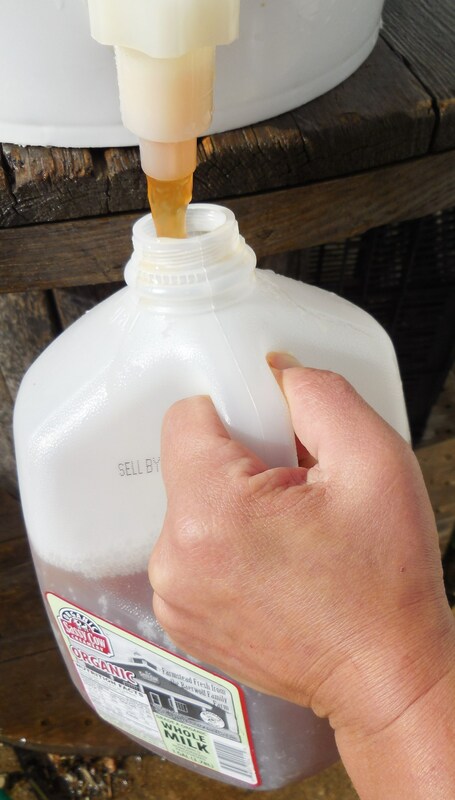 For months we save milk jugs from the milk we buy from our local organic dairy. We clean, air dry, and store them until pressing time. Into these jugs goes the cider. 32 gallons this year. A few were given away to friends and family, 22 gallons went into the freezer, 1 gallon is being made into cider vinegar (a yearlong process) and 5 gallons are being made into hard cider (a process which takes several months from start to finish). 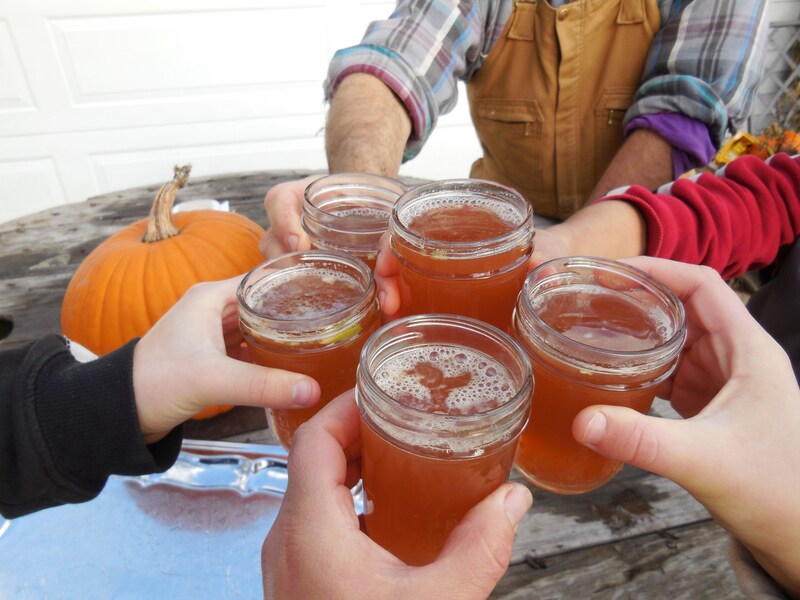 Cider sustains us in many ways—through friendship, through nourishment, through cheer. We work together to pick, to wash, to sort, to press, to drink. It is a beautiful (and delicious) time of year. What a lovely read! Great pictures too. Now I am thirsty for cider. Thank you for sharing another wonderful installment of what happens on the farm. Could you tell us a little a little bit more about your root cellar and storage areas? Thanks, Carol! I will definitely post about our storage areas soon. Great suggestion! Thanks for keeping us up-to-date on what’s happening on the farm. I have been encouraged to explore ways we can reclaim some control over the taste and nutrition of our food-one of the most inspirational ways being participation in this CSA. It is a very liberating feeling—making and growing and doing! I am so glad to learn that the CSA inspires you. Thank you for being a part of it. Beautifully written and that cider looks so delicious! I too liked the mysterious hand! Thank you, Peggy! While posting the pictures (and almost drooling on the keyboard) I knew I just had to get some sweet cider out and take a drink.